According to the Holy Qur’an, there are two ways of advancement - through increasing the propensity to enjoy and decreasing the propensity to enjoy. On the path of decreasing attachment, the killing of animals is not recommended. In the Holy Qur’an we can find following ayats: “Beautified for mankind is love of the joys (that come) from women and offspring, and stored-up heaps of gold and silver, and horses branded (with their mark), and cattle and land. That is comfort of the life of the world. Allah! With Him is a more excellent abode. “Some of you desired the world, and some of you desired the Hereafter.” (3.152) Thus the Holy Qur’an described two class of people: 1. Those who are attached to sense gratification and desire of the heavenly enjoyment; and 2. Those who renounce everything and strive for the love of God. For the general masses of people who are still unable to control their senses (tongue) provision for eating meat has been granted but it is not recommended so rules and regulations exist to slowly help one give up such bad habit (taste). But for those who desire the highest perfection of life, love of God, meat eating is forbidden. Thus we can understand from this verse of the Holy Qur’an that not every meat is permitted to eat. Only meat of an animal which is expressly killed for food with the Takbir, or the solemn mode of slaughter (zabh) in the name of Allah duly pronounced on it. This means that killing animals for food is a personal affair. 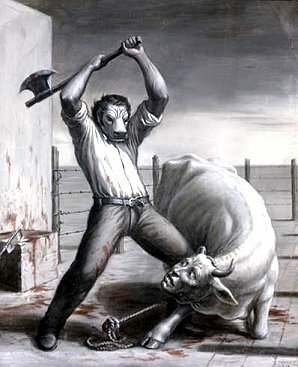 It does not suggest opening slaughterhouses and killing hundreds of thousands of animals in an organized way, everyday. Those who want to eat meat, should do this the proper way individually, because everyone needs to take responsibility for his own actions. On the Day of Judgment, all dead creatures will come to life and will take vengeance on those who had either teased them or killed them. This concession is given by Allah to those who cannot restrain from meat eating. By eating halal, lawful meat they will gradually subdue their passion and give up meat eating. This will help to develop fine spiritual sentiments, namely love for Allah. 2. in the special pilgrimage garb (ihram). This means that if someone kills an animal inadvertently within the limits of Mecca, one should then leave one of his pet animals there. In case one has no pet animals, one should give in charity food equivalent in value to the price of the killed animal. Otherwise the offender must fast as many days as the number of the poor who would have been fed under the second alternative. Thus killing animals is a sin and therefore, it is prohibited in a holy place like Mecca. So We gave him the good news of forbearing son. We called out to him, ‘O Ibrahim! You has already fulfilled the dream!’ Thus indeed do We reward those who do right. For this was a clear test. Then we ransomed him with a tremendous victim. Thus Ibrahim (Abraham) was born in Ur of the Chaldees, a place on the lower reaches of the Euphrates, not a hundred miles from the Persian Gulf. Where the worship of the sun, moon and stars was the prevailing form of religion. Ibrahim revolted against this quite early in life. They also had deities in their temples, which probably represented heavenly bodies and celestial winged creatures. He was still a youth when he broke the false deities. After this he was marked down as a rebel and persecuted. He was thrown into the fire. But the fire became cool by the order of Allah and Ibrahim was saved. Then he left his ancestral lands, and avoiding the Syrian desert, came to the fertile lands of Aram or Syria. This was the Hijrat (Flight) of Ibrahim. He left his people and his land, because the Truth was dearer to him than the ancestral falsehoods of his people. He trusted himself to Allah, and under Allah’s guidance he laid the foundations for great people. This was in the fertile land of Syria and Palestine when a boy was born, the first-born son of Ibrahim, namely Ismail. The name itself is from the root Sami’a, to hear, because Allah had heard Ibrahim’s prayer (The Qur’an. 37.100). Ibrahim’s age when Ismail was born from his maidservant Hajar was 86 (Gen. 16.16). The boy’s character was to be Halim, “forbearing”. This title is also applied to Ibrahim (The Qur’an. 9.114; 11.75). It refers to the patient way in which both father and son cheerfully offered to suffer any self-sacrifice in order to obey the command of Allah. Once, after Ismail had grown up to the age of discretion, Ibrahim had a dream that he now had to offer his only son in sacrifice. The command was conveyed to him via a dream. It was a test of the devotion for both father and son. Ibrahim consulted his son. The son readily consented, and offered to stand true to his promis if his self-sacrifice was really required. Actually, the trial and sacrifice was demanded of both Ibrahim and Ismail. Ibrahim had to sacrifice his only dearmost son and Ismail had to sacrifice his dear life. Finally this sacrifice was about to take place in the valley of Mina, six miles north of Mecca. Ibrahim was ready to sacrifice his son but his hand did not act. Then he covered his eyes with cloth took a knife in his hand, and tried to kill Ismail. But at that moment Allah replaced Ismail with a fine sheep or ram. So there was a ram instead of his son. Thus the son was saved and the ram was sacrificed (some scholars say that the ram was also saved). Since that day, the ‘Id Day or Day of Sacrifice came into practice. On this day in the valley of Mina, six miles north of Mecca, a commemoration sacrifice is annually celebrated as a rite of the Hajj on the tenth of Zul-Hijjah in Memory of this Sacrifice of Ibrahim and Ismail. This festival is also celebrated by all Muslims around the world. Hundreds of thousands of animals are annually slaughtered on this day. But let us carefully consider what was the main object of Allah’s teaching on that occasion. Did Allah ask for Ibrahim’s dearmost thing or did He ask for a ram. If Allah-Taala had liked a ram, He would have asked the ram itself. But merely to examine the devotion of Ibrahim and Ismail, He had ordered this sacrifice to test them both, and to save the son of Ibrahim, He had replaced a ram for Ismail. Now, just think carefully, to try to please Allah-Taala, instead of dedicating one’s dearmost object, to kill a ram is how justifiable? “It is not their meat nor their blood, that reaches Allah; it is your piety that reaches Him.” (22.37) Thus Allah does not require the flesh and blood of animals, much less of human beings. No one should suppose that meat or blood is acceptable to God. It was a Pagan fancy that Allah could be pleased by blood sacrifice. But Allah does accept the offering of our hearts. Allah does not delight in flesh and blood. But He does desire the giving of our whole being to Allah, the practical symbol of which is that we should give up something which is very dear to us, if duty requires that sacrifice. It was indeed a great occasion, when two men, the father and the son, showed the example of self-sacrifice in the service of Allah which is needed to qualify one for the supreme goal of life. This example made it clear that the only sacrifice which God requires from man is the Surrender of his will and purpose - i.e. Al-Islam. In the traditional qurban, the prayer known as the Kalimah is recited to remove the baser qualities of the animal. The recitation of the powerful Third Kalimah will not only purify the animal slaughtered for consumption, but also all those involved with the sacrifice, so that they will no longer want to slaughter animals. This will only work, however, if the prayer is said with pure devotion. “While you recite the Kalimah, you must complete the severing in three strokes of the knife, one for each recitation. The knife has to be swept around three times, and it must not touch the bone. It must be extremely sharp, and the length is prescribed according to each animal - so much for a fowl, so much for a goat, so much for a cow. ... Also, the animal must not regurgitate any food, and it must not make any noise; otherwise, it becomes haram. Once, Allah told the Holy Prophet Muhammad, “With this qurban the killing will be greatly reduced, for where they used to kill 1,000 or 2,000 in one day, they will now be able to slaughter only ten or fifteen animals. If they started after morning prayers, it would be ten o’clock by the time they are ready to begin, and they could slaughter only until eleven o’clock when they must prepare for the next prayer. In addition, it takes about fifteen or twenty minutes for each animal, because he has to wait until the soul has departed.” This is how Allah instructed the Holy Prophet. But Allah said, “Each one of you does not need to sacrifice one animal; you do not need to sacrifice one animal for each family. In place of forty fowls, kill one goat. In place of forty goats, kill ten cows. And in place of forty cows, kill ten camels. Sacrifice ten camels and then share the meat among the different families.” So in place of four hundred animals only forty might be killed. The killing was reduced by that much. Thus, Allah passed down the commands to the Holy Prophet to reduce the taking of lives. So, the conclusion is that if one understand the qurban from within with wisdom, its purpose is to reduce killing the poor animals. But if one look at it from outside, it is meant to supply desire with food, to supply the craving of the base desires. Thus, the esoteric imperative behind Islamic dietary laws is that Muslims aspire after compassion and mercy, first by minimizing the amount of animals one is able to kill (by following all the regulations), and then, it is to be hoped, by giving it up altogether. Thus “animals living on the earth” include those living in the water - fishes, reptiles, crustaceans, insects, as well as four-footed beasts. Life on the wing separately mentioned. “Tair,” which is ordinarily translated as “bird,” is anything that flies, including mammals like bats. In our pride we may exclude animals from our purview, but they all live a life, social and individual, like ourselves, and all life is subject to the Plan and Will of Allah. We have no right to destroy or kill these creatures, even flies and insects what to speak of birds and beasts. We never creates them to destroy. The Holy Qur’an said that they are people like you. They are also citizens of this planet and different countries. They are also under the protection of God and Governments. It is the duty of government to protect it’s subjects, which includes the innocent helpless animals, and punish those who torture and kill them. “A sign for them is the dead earth. We revive it and We bring forth from it grain so that they eat thereof. And We produce therein gardens of the date-palm and grapes, and We have caused springs of water to gush forth therein. From these ayats it is obvious that Allah creates milk, honey, corn, grain, olive, dates, grapes and all kinds of fruit as food for mankind. Verily it is a sign for people who have an understanding. We should be thankful to -- .Allah for His mercy and not ungratefully shed blood of innocent helpless animals simply to please the uncontrolled tongue. Man milking a cow who sheds a tear as she loses the milk intended for the calf tied to her leg. The Holy Prophet Muhammad’s death emphasizes the harmfulness of meat-eating. The story goes that a non-Muslim woman invited the Holy Prophet and some of his companions to a meal and served them poisoned meat. The Holy Prophet Muhammad knew by spiritual insight that the meat was poisoned, for he spat out piece of meat which he chewed, but one of his companions died on the spot. Although it was not his custom to eat any food prepared by non-Muslim, on this occasion, mysteriously, he did. The poisoned meat put him in a sickbed for about two years, and finally, in A.D. 632, he died. According to some scholars, the Holy Prophet Muhammad ate the poisoned meat just to show the stubborn masses the harmfulness of meat-eating. Those Muslims who go for Haj (pilgrimage) to Mecca, wear a simple garment of unstitched cloth in two pieces which is called ihram. The putting on of the pilgrim garb (ihram) is symbolical of his renouncing the vanities of the world. From the time he put on this religious dress, absolutely no killing is allowed: not mosquitoes, bugs, grasshoppers, or any other living creatures. If a pilgrim sees an insect on the ground, he will gesture to stop his comrades from inadvertently stepping on it. After this and until the end of the pilgrimage he must not wear other clothes, or ornaments, anoint his hair, use perfumes, hunt, or do other prohibited acts. If any louse appears on that ihram it is not thrown on the ground but allowed to remain where it is. If the throwing away of a insignificant living being like louse is forbidden in Islam just think how much inauspicious is killing of animals. It is said in Aine-Akbari that on several occasions such as from Friday to Sunday and eclipse days Akbar abstained from taking meat. “If you want to live in heaven for all time to come, then behave in a spirit of compassion and sympathy with the entire creation of God. The famous Muslim saint, Mir Dad, said that anyone who eats the flesh of any living being shall have to repay it with his own flesh. He who breaks another living being’s bone shall have his own bones broken. Every drop of blood shed, will have to be accounted for by one’s own. Because that is the eternal law. The great Muslim saint Sarmad condemned meat-eating by saying that the light of life is asleep in metals, is dreaming in plants, is awake in animals and is completely alert in human beings. Kabir, addressing Muslims, makes it clear that even fasting (Roza) is in vain if its practitioner lets his tongue dictate the killing of living beings for the sake of its taste. Allah will not be pleased this way. During Silloh also no meat is taken, because it is said, that meat is a bad food which disturbs the prayers. Everyone knows that meat eating increases passion. It is very difficult to pray and concentrate the mind on Allah in a passionate condition. Therefore it is recommended by great saints of all ages that vegetarian food is much more appropriate for spiritual practices. If one wants to increase peace of mind and concentration on Allah he should decrease or, better, stop meat eating. It is practical advise from which everyone will get immense benefit. Summarizing the above mentioned statements, we can easily and naturally conclude that meat eating is a great impediment on the path of self-realization. Those who are sincerely trying for spiritual progress should restrain from meat eating. On the path of decreasing material attachments and increasing spiritual attachment to Allah, restraining meat eating is compulsory. 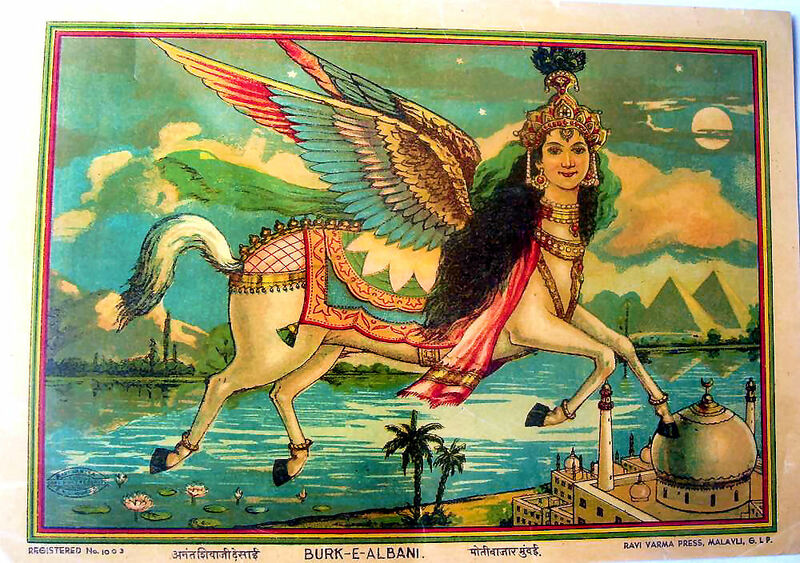 Burk-E-Albani / Buraq : Islamic Kamadhenu? 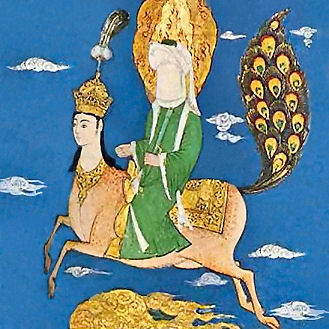 Is this the representation of the horse Harak, climbing which prophet mohammed is supposed to have visited different worlds? Or some other motif mentioned in Islamic books? 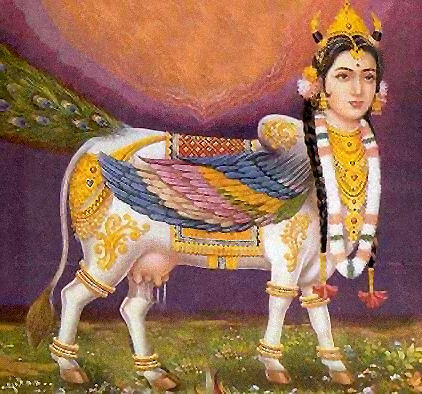 I am amazed at the ease with this artist from India (Ravi Varma Press) has blended motifs and icons from different cultures and religions. 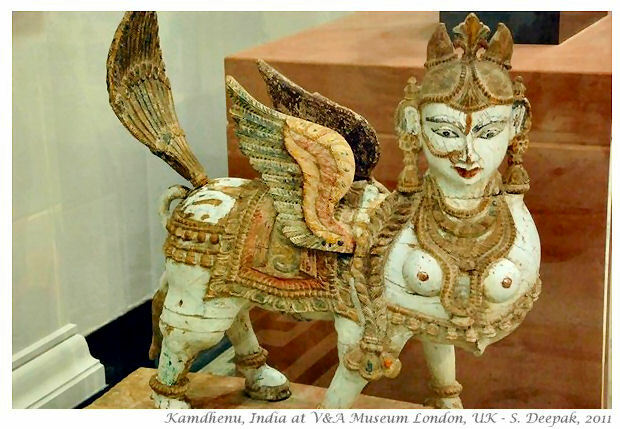 The Goddess Shri Kamadhenu is sometimes depicted as a cow, but sometimes also as a mystical winged cow with a peacock's tail and the head of a beautiful woman. This iconography is very similar to that of Al Buraq, the feminine angelic being who carried the Prophet Muhammad on Her back on the Night Journey, and who is an example of the Divine Feminine in Islam. 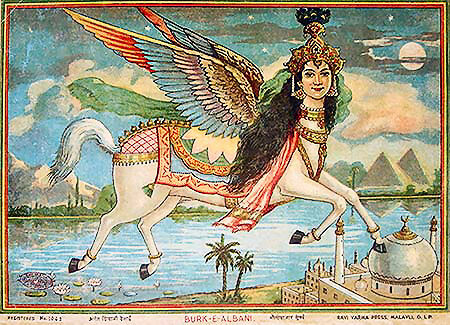 While mystic Kamadhenu is described as a winged cow, the Al-Buraq is described as a winged horse. 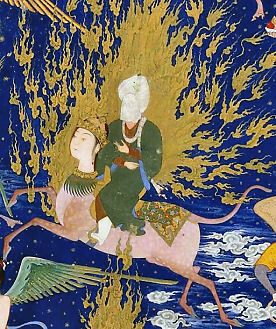 Al Buraq is an angelic female being with the head of a woman, the body of a horse and a peacock's tail, who carried the Prophet Muhammad, on the Miraj, the Night Journey, through the Seven Heavens to Jerusalem. From these four ayats of the Qur‘an it is obvious that when Allah created Adam and Eve, He gave them in food, the fruits. And when the pious will go to paradise they will have their food in the form of fruits. Then when Allah created earth He "produced fruits as food for" mankind. Also from the very life of the Hazrat Muhammad, we can see His daily food was bread, milk and palm-dates. 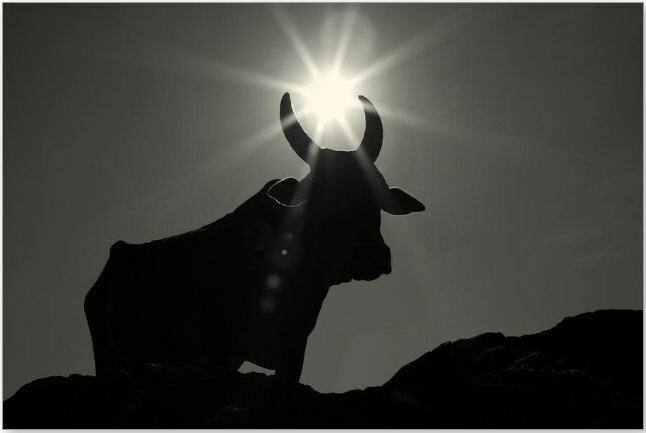 Sometimes in His life he sacrificed sheep or camels, but never cows or bulls. This story was accepted in Jewish traditions, which are themselves based on certain sacrificial directions in the Old Testament. 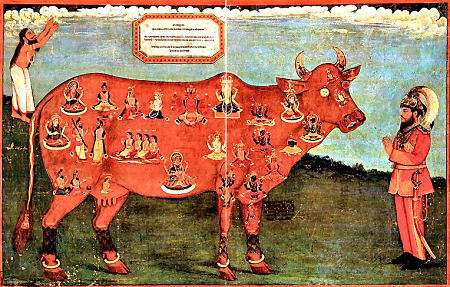 The cow story of Jewish tradition is based on Num. 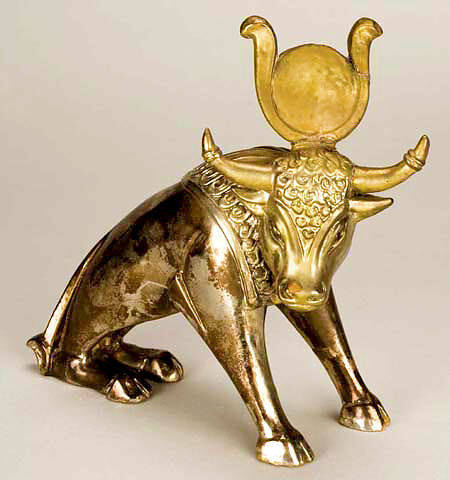 19.1-10, in which Moses and Aaron ordered the Israelites to sacrifice a red cow without a spot. Thus Moses announced the sacrifice to the Israelites, and they treated it as a jest. When Moses continued solemnly to ask for the sacrifice, they put him off on one pretext followed by another, asking a number of questions which they could have answered themselves if they had listened to Moses’s directions. Their questions were carping criticisms rather than the result of a desire for information. It was a mere thin pretence that they were genuinely seeking for guidance. When at last they were driven into a corner, they made the sacrifice, but if they did this willingly then the sacrifice would have been more efficacious for their purification from sin. The cow’s body was to be burnt and the ashes were to be kept for the purification of the congregation from sin. We can see and learn from this narration that the killing of a cow was very dangerous and not part of the teachings. So much so that the people were very hesitant to commit such an act even when the order came from the high authorities, Prophet Moses. So this particular sacrifice was not carried whimsically but with due consideration. We should understand also, the cow was not simply killed for the sake of eating but the body of the cow was burnt and the ashes were to be used for the higher purpose of purifying the people from their sins. 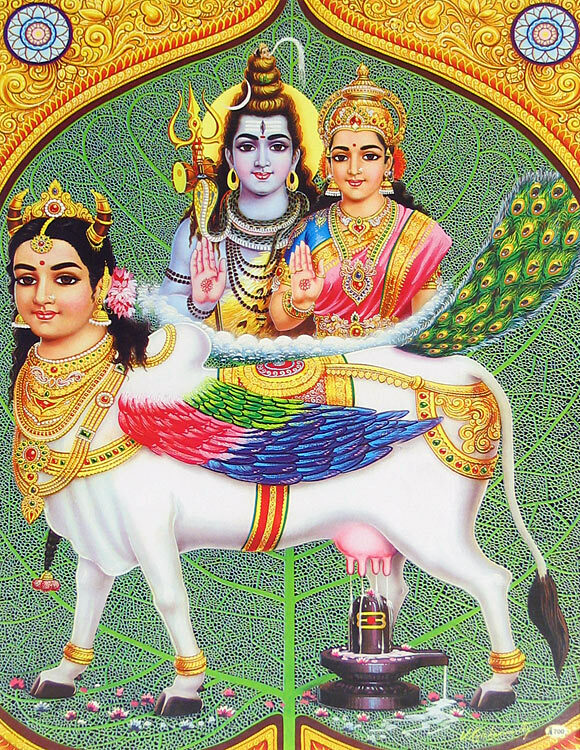 It is very important to mention that in the present age also, cow sacrifices is forbidden, because no qualified persons are available to conduct such a sacrifices. Thus by reading the Holy Qur’an we can conclude that cow killing is not sanctioned in the Holy Qur’an and the only cow sacrifice which has been described was not meant for meat eating but for purification from the sins. “The meat of cow is marz (disease), it’s milk is safa (health) and it’s ghee is dava (medicine).” Is it not more intelligent to protect cows and use their milk and ghee for our benefit? 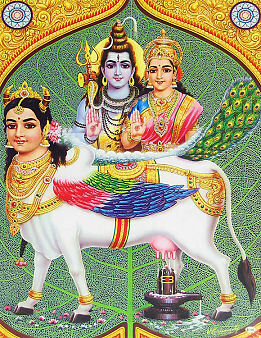 The cow is considered a mother of mankind because she gives us a valuable product such as milk. As a mother feeds her child with her breast milk similarly the cow feeds mankind with her milk. It has been scientifically proven that if one regularly drinks cow milk his fine brain tissues develop. As a result of this one’s memory capacity increases, favoring remembrance of Allah. 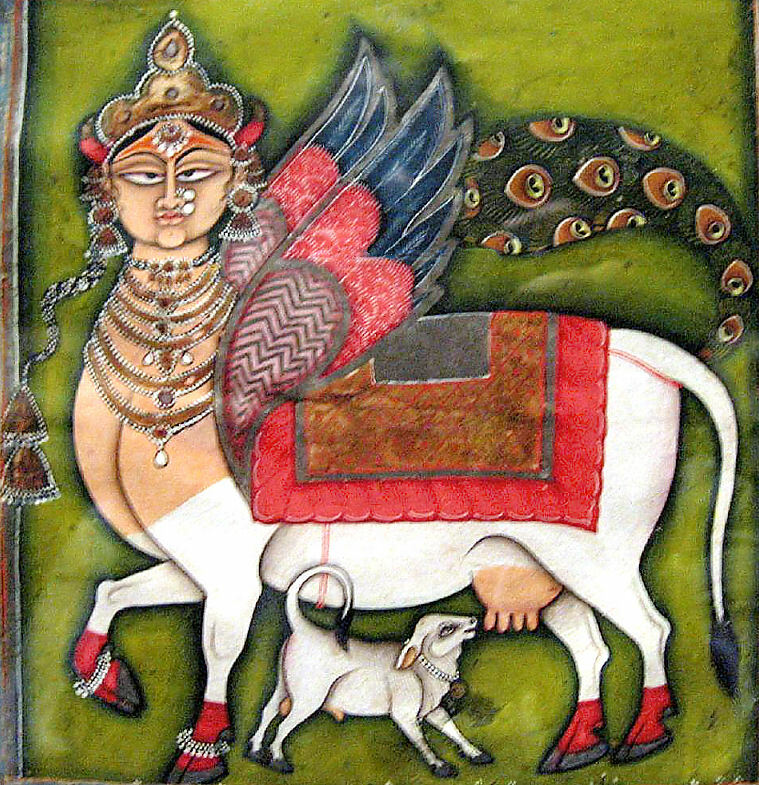 Therefore the cow and it’s milk is very important for proper development of human society and killing the cow is the greatest sin. 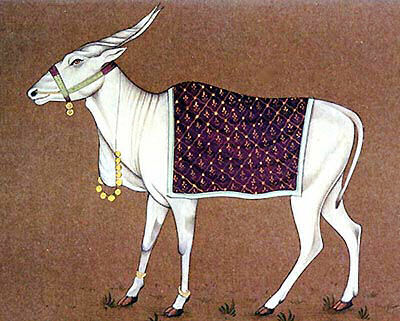 Those who are eager to eat meat, they can eat less important animals like sheep and goats but cows should be protected. A Imam of the Shah Jehan Mosque in London, England, Al Hafiz B. A. Masri says that the Qur’an itself is very specific about prevention of cruelty to animals. Muslims, who form one-third of the world’s total population, need to begin a movement for the prevention of cruelty to animals based on Islamic tenets. It was time to ensure that all precepts laid down in the Qur’an against cruelty to animals were followed strictly everywhere in the world. Therefore he wants to start a unite of the Society for Protection of Cruelty to Animals in the Islamic world. Animal welfare worker Al Hafiz Masri would love to see the world embrace vegetarianism. In his book Islamic concern for Animals, Al Hafiz Marsi has expressed sorrow about the excessive killing of animals in the name of religion. Quoting from the Holy Qur’an Majeed and the teachings of the Holy Prophet Muhammad, he described all acts of torturing of animals, and even keeping birds in cages as sinful. According to him even the cutting of trees is prohibited in Islam. The Imam Marsi is himself a vegetarian and advises everyone to adopt vegetarianism. The Koran teaches compassion and mercy. Each of its 114 chapters, except one, begin, "Allah is merciful and compassionate." The name of God used most often in the Koran is "al-Rahim," which means "the All-Compassionate." Mohammed taught love and respect for nature, compassion for animals and condemned the needless suffering and death of other living creatures. Vegetarianism and animal rights are consistent with Islam. Islam teaches that in Mecca, the birthplace of Mohammed, no creature can be slaughtered and that perfect harmony should exist between all living beings. Muslim pilgrims approach Mecca wearing a shroud ("ihram"). From the moment they wear this religious cloth, absolutely no killing is allowed. Mosquitos, lice, grasshoppers, and other living creatures must also be protected. If a pilgrim sees an insect on the ground, he will motion to stop his comrades from accidentally stepping on it. Islam teaches respect for animals and nature. 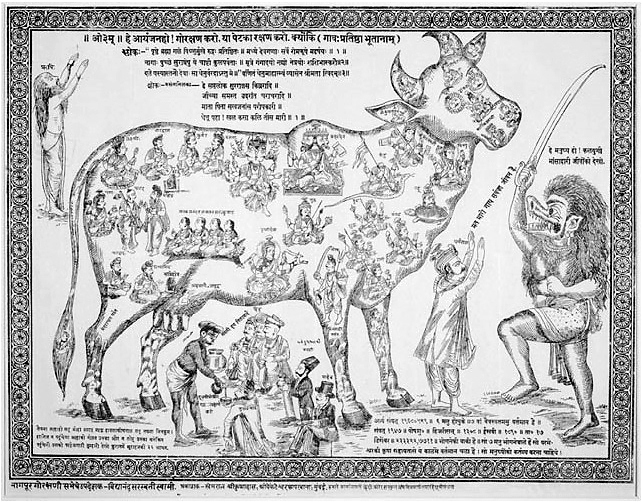 A pamphlet protesting the Muslim practice of beef-eating. 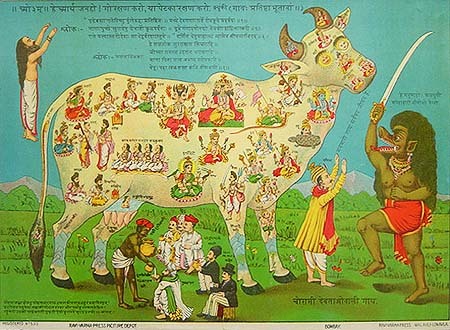 The demon Kali (far right) attempts to slaughter the sacred cow, represented by "the mother of cows"Kamadhenu in whose body all deities and gods are believed to reside. The color version ran by the Ravi Varma Press (c. 1912). 9. Bhagavad Gita TUrkce, 900 pages complete with Sanskrit texts & word for word. 10. All of Prabhupada’s DVDs are now in Turkish. The books are designed to help Krishna-conscious devotees present a Vedic viewpoint to members of the Muslim community in a non-argumentative way, as well as to encourage Muslim readers to deepen and strengthen their efforts at God-realisation. Our goal is to build a strong foundation of mutual understanding so that everyone's love and devotion towards the Supreme Lord whom we call Krsna and whom Muslims call Allah -- can be ignited and cultivated favourably. Srila Prabhupada: "Kisi Krishna bilinli hale geldigi zaman herkesi sever. YŸksek sesle Hare Krsna'yi zikrederseniz, duyan karincalar ve bšcekler bile kurtulur ŸnkŸ bu ruhsal titresimdir." HARE KRSNA HARE KRSNA KRSNA KRSNA HARE HARE HARE RAMA HARE RAMA RAMA RAMA HARE HARE...be happy! Srila Prabhupada: "When one becomes Krsna consciousness, he loves everyone. If you chant loudly Hare Krsna, even the ants & insects who is hearing, he'll be delivered, because it is spiritual vibration"